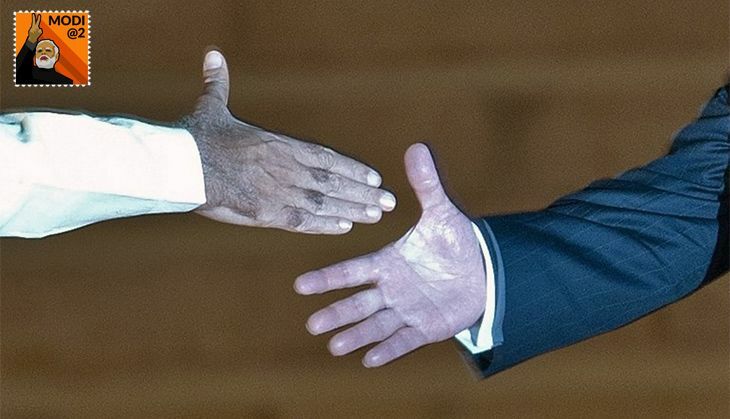 Narendra Modi started out brightly on the foreign policy front. How has he fared in the 2 years since? In May 2013, for the first time ever, a government in Islamabad changed through an election, an event truly historic. 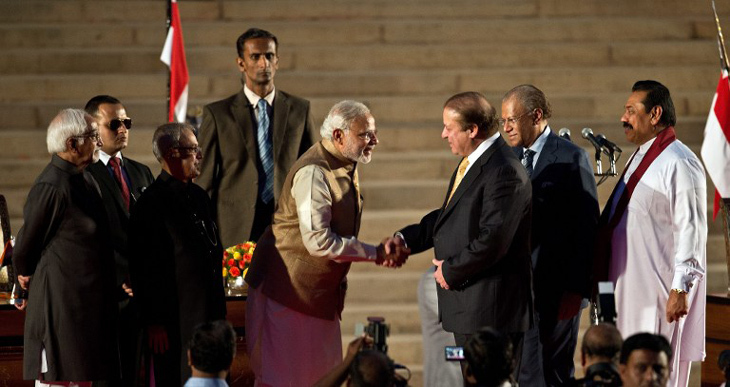 Nawaz Sharif, who won the election, announced that he would invite the Indian prime minister to his inauguration. This was quixotic and brave but he didn't: perhaps worse sense prevailed, or timid counsel. A year later, elections in India brought the BJP to power, a humdrum change of guard in a mature democracy which needed no celebration, but Narendra Modi trumped the Pakistani prime minister, inviting all SAARC leaders to see him take oath. And they came, except Sheikh Hasina. Because Modi's stray remarks on foreign policy as chief minister of Gujarat and prime ministerial candidate had kept both sense and sensibility at arm's length, these invitations were hailed as an out-of-the-box initiative from a man who had been fiddling with the Pandora's box. But there were points of worry even then, though swamped by nervous relief. First, there was a touch of hubris in the invitations, a hint of an imperial summons to satraps to pay tribute at a coronation. And asking Navin Ramgoolam of Mauritius, a leader neither in SAARC nor the neighbourhood but a Hindu governing a country with the highest percentage of Hindus after Nepal and India, showed that for Modi, Hindutva is a calling, not a convenience. It was nevertheless a brilliant beginning, though far from unique as Modi's acolytes claimed; he was following what most of his predecessors had done at the outset of their tenures. None were as dramatic as he was, but Rajiv Gandhi, IK Gujral, Atal Bihari Vajpayee and Manmohan Singh all started out on a high with the neighbours like skiers in a giant slalom, where the object of the game is to manage a swift descent from the peak, twisting elegantly through obstacles to reach level ground standing and in one piece, but a long way off and a long way down from the top. And then clamber back up the hill to do it all over again. Modi went off piste, which is dangerous for the adept and can be fatal for the novice, which in foreign policy he was. What should have been a controlled traverse to rock bottom has turned, as soon as he hit the first moguls, into a manic, uncontrolled tumble, which would be hilarious if the consequences were not so potentially grave for the nation and its neighbours. Two years after his Delhi Durbar, almost the only relationship in good repair is with Bangladesh, whose prime minister did not come to it. And she is about to feel the tip of the ski where it hurts, not because Modi wants it but because he has lost control. The recently held assembly elections have brought the BJP to power in Assam, and returned the Trinamool Congress to office in West Bengal. Sarbananda Sonowal may be the human face of Hindutva now, but his claim to fame is getting the Supreme Court, in 2005, to throw out the Illegal Migrants (Determination by Tribunals) Act, 1983 in a judgment which described the influx from Bangladesh into Assam as "external aggression", against which it's the duty of the Union, under Article 355 of the Constitution, to protect states. (It's a mercy the court did not direct the government to unleash the Eastern Command forthwith against the aggressors. Chief Minister Sonowal has to return to Bangladesh the unwanted gifts of its aggression - the millions of them - before he seals the border, as he says he hopes to do in two years. If Modi doesn't help, the 56-inch chest collapses like a snow-flake; if he does, he becomes even more of a giant snowball. In West Bengal, Trinamool has won every constituency in the catchment area of the Teesta, except Jalpaiguri. Mamata Banerjee will see no reason to shoot herself in the foot, and immediately alienate this vote bank by giving water from the river to Bangladesh through an agreement finalised by the Congress, which has now joined the Left in her desolate doghouse. 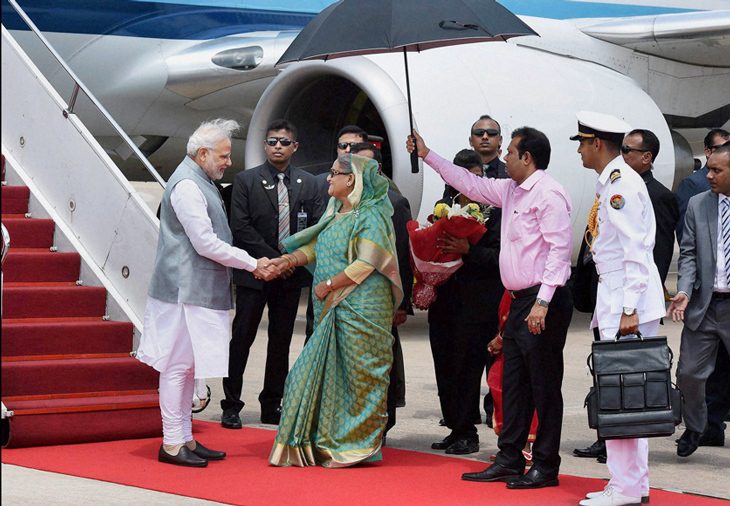 Modi will soon, therefore, have two major headaches with Bangladesh -- water he can't give and humans it won't take, just when Hasina will be the most importunate. The trials she has launched of the war criminals of 1971, and their preordained executions, have little to do with justice even though the retribution was richly deserved. Like some in the BJP, she wants to polarise her nation to consolidate her support. Unlike India, however, Bangladesh, even in 1971, was a nation deeply divided. Since then, as elsewhere, religiosity has lurched from conservative to fundamentalist, but is now again, as in 1971, turning violent as the zealots rally to defend themselves and avenge the hangings of those they consider martyrs. The killings that have started of atheists, LGBT activists, of anyone who dissents, mirror those of 1971, and are the first gusts of the whirlwind that will hit Hasina, the sower of the wind. There will be more panic-struck flights from Bangladesh, just as Assam and the Centre try to push back those already here. Pandemonium beckons. 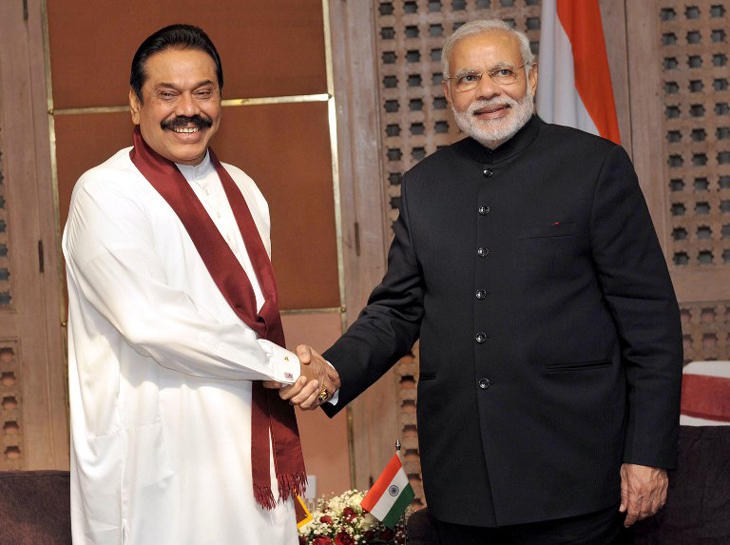 With these two neighbours, Modi's problem is that China offers even more protection than India can, against international demands for fair inquiries into war crimes in Sri Lanka and for fair trials of political opponents in Maldives, without the sotto voce cant about human rights they get from India when it must get its superiority off its chest and the evangelists off its back. And China brings in investments and tourism India simply cannot match. Tourism is almost 50% of Maldivian GDP and it accounts directly for 50% of the jobs; adding jobs indirectly supported by tourism, it's almost 90%. In 2016, 50% of the tourists are expected to be Chinese, 3% Indians. That says it all. Sri Lankan dependence on China is not so absolute but India offers no alternative. 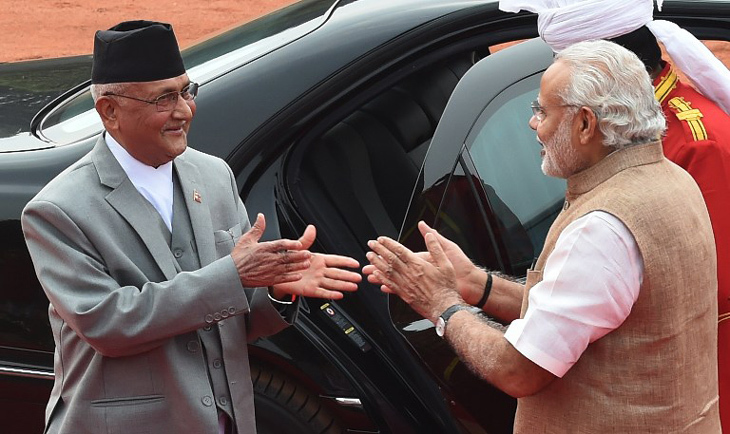 Nepal understands the "quintessential conceptuality" of Hindutva better than the BJP does. What the court would call "percipient discord" will, therefore, fester. And so to Pakistan, where it is hard to tell in the avalanche Modi has set off if he has lost just his skis, or his marbles as well. He drew red lines; they turned saffron and then green. He went over for tea with Sharif Jnr; Sharif Snr sent over jihadis for mayhem. Modi was taken aback: he hadn't read it in the tea-leaves, so we now have a dialogue unwanted dead or alive, rapidly freezing, like a skier under a snow slip he has set off, waiting for a friendly St. Bernard to come along. Or perhaps for a disaster, because Modi's India does disasters very well, as Maldives, Nepal and Sri Lanka can vouch. Its tragedy is that it's the first provider in a crisis, the last resort when things go well. calamitously cack-handed Geospatial Information Regulation Bill drafted by Modi's government becomes law, because thereafter rescue workers would have to seek licences before they could upload the coordinates of the altered landscapes in which they find themselves working. This is one of the countless stupidities the bill would spawn, apart from sending to jail anyone who draws Bharat Mata's contours without exactitude. Islamabad, of course, has sent to the UN what the Supreme Court would have called its "proponements of oppugnation", its objections to the bill. We can dismiss this as bare-faced cheek, in courtly language, the buccality of an unapparelled visage, but the fact is that there are stretches on India's borders with every neighbour that have not been demarcated or delineated. That includes sections on the Manipur-Myanmar border, Kalapani and Susta with Nepal, and the point from which our base lines start with Bangladesh, where there is a difference in the alignments of the arbitral award on the maritime boundary and the land boundary agreement. The drafters of the bill had China and Pakistan in their sights, but hadn't realised their weapon is scattershot. India's neighbours might well feel that they swing between its benign neglect and its malign attention. Perhaps Modi should turn his gaze further afield for a while, to Somalia maybe, about which, as Malayalis will attest, he seems to know a fair bit. लेखक पाकिस्तान में भारतीय उच्चायुक्त रह चुके हैं.